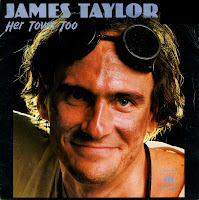 James Taylor was born on March 12, 1948 in Boston, Massachusetts (USA). At the age of eighteen he became involved in the music business. Six years later, in 1972, he married Carly Simon. By that time, both were successful singer/songwriters. In 1981, James Taylor released his eleventh album, 'Dad loves his work'. The album's title was, in part, drawn from the reasons for Taylor's divorce from Carly Simon. She gave him an ultimatum: cut back on his music and touring, and spend more time with her and their children, or the marriage was through. The album's title was his answer, and the divorce took place soon after. The emotional repercussions of the divorce likely served as at least part of the inspiration for 'Her Town Too'.